You can find silver not only in Kota Gede (Gede city), but there’s something different about this city. This place was not just a place to hunt silver crafts, but there are many place you should see, for examples you can see many old buildings, a combination between European and Javanese style. If you want to buy silver crafts for souvenir in Yogyakarta, you should come to Gede city. 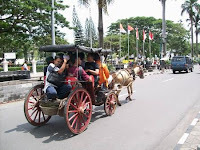 Gede city is a small town only 10 kilometer upon the South East of Yogyakarta. There are many shop and house which sell silver crafts. Alongside the street, there are still stand old houses netherland debris and house with European-javanese style. Long ago, before this city become the center of silver crafts, Gede city was the first capital city of Mataram dynasty, and the first king was Panembahan Senopati. Panembahan Senopati receive this region which was a jungle called Alas Mentaok from Sultan Pajang, King of Hindu dynasty in East Java. Gede city became the capital city until 1640, coz the third king of Mataram Islam, Sultan Agung, moved it to Desa Kerto, Plered, Bantul. Silver Craftsman existence showed along with Mataram, and also Verenigde Oost-Indische Compagnie (VOC) which came to Yogyakarta at 16 century ago. At that time, there are many VOC merchantmen who order household-wares from gold, silver, copper, and brass to the local people. This Mataram dynasty and VOC influence makes those houses looks like the combination between Javanesse and European, also known as Rumah Kalang (Kalang house). The unique thing of Kalang house is, the joglo (the javanesse style) become the main house placed at the back and European style house in the back. The europen building inclined baroque, with Corinthian and doriq. And as the Joglo, especially the pendopo (large open structure in front of Java mansion, or attached open veranda that serves as an audience hall) was modified, become closed. Generally, javanese Pendopo separated from the main building. Since 70’s, silver crafts made from Gede city were had a great vogue by foreign tourists; the jewelry, household-wares or other accessories. 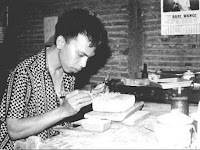 The location of silver craftsman were apportionment, start from Kota Gede market until Masjid Agung (Great Mosque). There are about 60 store sell these silver crafts. Handmade (need more hand carefulness, such as ring and necklace). Not all of the process use pure silver but mixture between silver and copper. One hundred percent silver mixed with 7.5% copper. If you only use pure silver the craft will be to soft and not strong enough to be a handicrafts. So, copper become the ingredient which function as hardness agent. Gilapan was organized as sheet or rodding silver, and then strike with special tool like hammer. And them mould-able as design such as teapot, glass, plate, spoon and other handicrafts. Trap was made from, rodding silver which strike over and over again until thin and longitudinal. After that, pinch with pinch pliers so that form silver yarn using yarn whisk. The silver yarns were placed at a paper appropriate with the design. In order to stick, spread the yarn with silver patri powder, and then heat it using scolding fire, then boiled with alum. Alum was used to wash out the black spot caused by the flame. The result was amazing, necklace, earring, and brooch. It costs from Rp 20.000 until Rp 30 millions. Kota Gede silver crafts were still had a great vogue to local and foreign tourists. rombongan.